Nothing compares to the taste of freshly baked homemade bread. 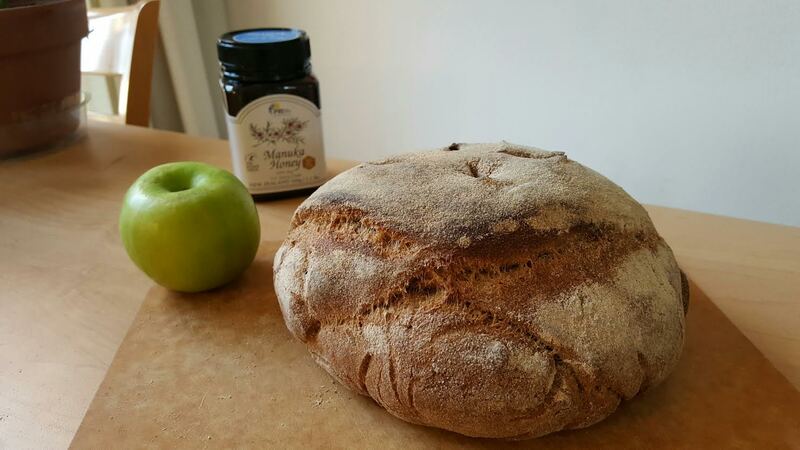 The Manuka Honey Whole-Wheat Sourdough Ciabatta bread is a unique and tasty way to bake with Manuka Honey! Give this delicious recipe a try with Manuka Honey 10+. Makes one medium loaf; double the recipe for a large loaf. Combine the active dry yeast and warm water in a large bowl for about 10 minutes. The sourdough starter contains wild yeast, but the active yeast will help the bread rise more quickly and form the distinctive large holes in ciabatta bread. If the yeast mixture isn’t frothy after 10 minutes, try adding 1/2 teaspoon of white sugar and waiting until bubbles form. In a small bowl, mix together the flour, salt, and wheat gluten. Whole-wheat flour is denser than bleached flour; the gluten helps with the development of large air bubbles and will make the texture of the finished loaf less dense. Add the dry ingredients to the yeast mixture. Add the sourdough starter and honey. Mix to combine. The honey is the secret ingredient! It cuts the sour taste of the dough just enough, helps fuel the yeast activity, and prevents the bread from going stale quite as quickly. Knead by hand (or in an electric mixer) until the dough comes cleanly off of the sides of the bowl (about 10 minutes by hand). It will be quite wet and loose, but should still be elastic and hold together. If the dough is too runny, add a tablespoon of whole-wheat flour until it can be kneaded. Place the dough into an oiled bowl. Spray/rub some olive oil over the top of the dough to keep it from drying out. Cover the bowl with a towel or loose-fitting lid and wait for eight hours or overnight. The dough should rise quite a bit. After the dough has risen, turn it out onto a floured piece of parchment paper and shape it into a rectangular loaf with your hands. Don’t over-handle it; you don’t want to squeeze out the air bubbles that have formed. Dust the loaf with some more flour and let it sit in a warm place for about 90 minutes so it can rise again. 30 minutes before you begin baking the bread, begin preparing the oven. You can use a pizza stone or a metal pan for this bread. Place your stone/pan into the oven. Also place another empty rimmed pan or cookie sheet on the bottom rack (it needs the rim because it’s going to hold water later). This bread can be baked successfully even in a convection toaster oven! If using a convection oven, preheat your oven to 450 F/230 C. If using a traditional oven, preheat to 500 F/260 C.
After the loaf has risen for 90 minutes and the oven has preheated for 30 minutes, put the parchment paper and the bread onto the pizza stone/pan. Add a half cup of water to the rimmed pan/cookie sheet below; this will steam the bread during the initial few minutes, helping it to form a better crust. Bake for 30 minutes (some additional time might be necessary in a convection oven). Remove the bread and allow to cool before removing it from the parchment paper. Store in a closed paper bag.